A relatively large number of research publications has appeared in the peer-reviewed literature since we last updated our readers on fracking and methane, CH4, emissions. We cannot discuss them all here. However, in summary, it can be concluded from these papers that EPA is very likely underestimating fossil fuel related methane emissions in its greenhouse gas inventory, anywhere between 30% and 100%, possibly even more. Meaning, in order for the US to effectively lower its greenhouse gas emissions, it also needs to get fugitive methane emissions under control. … suggests that inventoried methane emission totals have not been increasing over the last ten years. Decreases in “waste” related emissions (primarily from landfills) have been counteracted mostly by increases from “agriculture” related emissions (mostly exhaling cows) and increases in “energy” related emissions. Meanwhile, global atmospheric methane concentrations continue to rise. There is evidence from satellite observations that US emissions have increased by 30% or more in the last decade, and a substantial amount of the global increase could be explained by increasing US emissions. However, there is also indirect isotopic evidence that the global increase is dominated instead by a biogenic source, with the authors highlighting agriculture in East Asia. The latter is somewhat corroborated by where most of the atmospheric methane seems to come from, namely the tropics, but there remain large estimate ranges in part due to limited measurement capabilities at tropical latitudes. Independent evidence comes from global observations of atmospheric ethane, which turns out to be an excellent tracer of fossil fuel related hydrocarbon emissions. While ethane’s abundance had been dropping for decades as the industry’s fossil fuel exploration activities had been becoming more efficient, it appears to be increasing in the atmosphere again, with especially high emissions from shale regions that produce oil. TheNature Geoscience authors estimated an ethane emissions increase of approximately 0.4 million metric tons per year, seemingly all from North America. Since, ethane is typically five to ten times less abundant relative to methane in oil and gas sources (on a molar basis), one can estimate an annual methane emission of 1-2 million metric tons from that, with a likely range of 0.5-4 million metric tons CH4 (Helmig et al. estimate a lower median ethane-to-methane ratio, thus arrive at the upper end of this range). 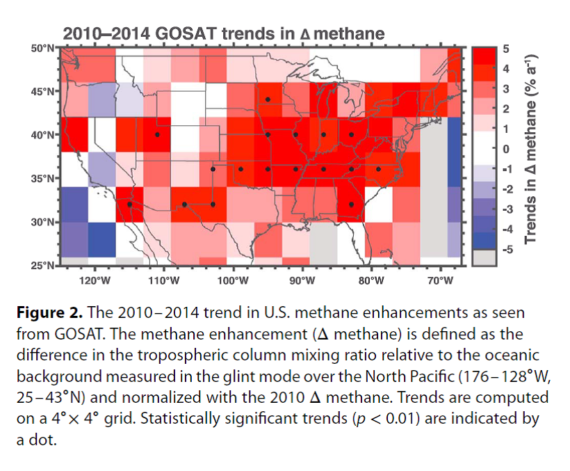 That turns out to be about 5-10% (at most about 25%) of the observable global annual increase of methane in the atmosphere (virtually all of it in the northern hemisphere), and is therefore roughly consistent with the above notion from isotopic analysis that the renewed global methane increase is not dominated by increasing fossil fuel-related emissions. However, an additional 1-2 million metric tons of methane per year is equivalent to 25-50 million metric tons of CO2 equivalent using methane’s 100-yr global warming potential adopted in 2007, which the EPA is currently using for international compatibility reasons. As is obvious from EPA’s graphics above, the current growth rate estimated by EPA is much smaller, actually around 10 million metric tons of CO2 equivalent for the “energy” sector. While I consider it unlikely that EPA is off by a factor of 5, this clearly shows that its estimates are still woefully off the mark. Ethane was also used in another study to estimate that, globally, relative leak rates are likely in the 2-4% range, and Carbon Brief has just summarized some data to show that the US and Russia are among the worst offenders. Part of the reason for the discrepancy to inventories comes from what has been dubbed “super-emitters”; the fact that the distribution of emission rates from the plethora of individual sources in the oil and gas industry (such as leaking valves, tanks, compressors, etc.) is poorly characterized by a well-behaved bell-curve. Instead, emissions appear to be dominated by a relatively small subset of high emitting sources, creating highly skewed emission rate distributions. This has been discussed in various research papers, such as here, here, here, and a presentation by Stanford University’s Adam Brandt here. It turns out that hydrocarbon emissions from storage tanks are a major source, a source however, that could rather effectively be abated, and that has been known for many years, with EPA addressing “VOC new source performance standards” as early as 2012. This has yet to make a difference, because it addresses only new, not existing sources (including storage tanks). Since EPA is not accounting for super-emitters through a skewed emission rate distribution, it is blind to their emissions. In addition, since EPA’s inventory is based on a classical bottom-up calculation that relies on input data from individual, small-scale measurements such as performed by industry itself and in industry’s favorite peer-reviewed study, it is useful to point out that a significant subset of those measurements have been shown to be biased low. Their best case scenario assumes that relative leak rates, globally, are about 50% higher than what EPA currently estimates (based on Brandt et al., 2014). Since we know by now that even that could be too optimistic, it becomes more and more obvious that a switch from coal to natural gas for electricity production is not likely to curb global warming effectively, but rather delay effective measures further.